Rafael Hadad of Israel went missing in Libya five months ago. He has finally been released, after complex diplomatic maneuvering. Israeli citizen Rafael Hadad has been released by Libya after being detained there for five months. He was in the country as an emissary of the Jews of Libya Federation, for the purpose of photographing Jewish sites in Libya. Hadad holds duel Israeli and Tunisian citizenship. Hadad's freedom was obtained following intense and complex diplomatic efforts, held under a cloak of secrecy. The Israeli media abided by the gag order placed on the case, and the Israeli populace was not even aware that Hadad was being held captive. It was feared that publication of the story would raise the price Libyan leader Moammar Khadaffi would demand of Israel for his release, as has happened in other well-publicized cases. Ultimately, in exchange for Hadad's freedom, Israel agreed to allow Libya to build 20 buildings inside Gaza. Libya had initially demanded to land a boat in Gaza, but Israel refused, insisting that people and materials be sent to Gaza via a land crossing instead. Among the countries that played a role in the secret contacts were Italy, France, and the United States. Also involved were members of the Libyan Jewish community, the office of the President of Tunisia, the Libyan foreign minister, and the man who is given the most credit for the successful conclusion, Austrian businessman Martin Schlaff. 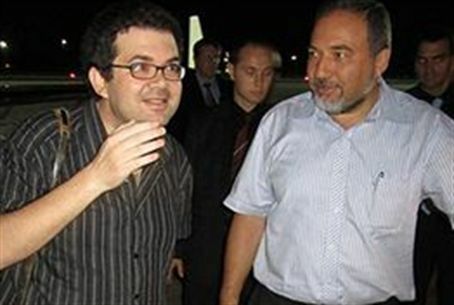 Schlaff is known for his ties with leaders worldwide, and is close to both Khadaffi and Foreign Minister Avigdor Lieberman (pictured above, at right, with Hadad). Schlaff was recently rumored to be involved in talks between Israel and Libyan activists regarding a Gaza-bound Libyan ship, had close ties with now-comatose Ariel Sharon, and was a co-owner of the ill-fated casino in Jericho. Schlaff's efforts were successful in Hadad's case. Lieberman flew to Vienna on Sunday night and met Hadad, and the two are scheduled to return to Israel today, Monday.